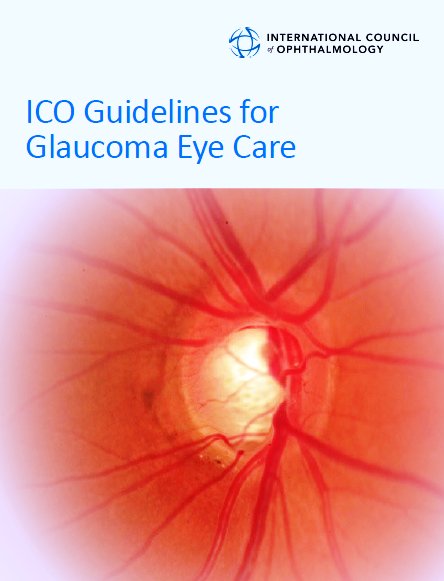 The International Council of Ophthalmology (ICO) had released its guidelines for the care of glaucoma patients in 2015. The guidelines consist of only 28 pages, with hardly 17 pages devoted to actual recommendations for glaucoma care.This makes it one of the briefest guidelines for glaucoma management. Glaucoma refers to a group of diseases, in which optic nerve damage is the common pathology that leads to vision loss. The risk of blindness from glaucoma depends on the height of IOP, severity of disease, age of onset and other determinants of susceptibility such as family history of glaucoma. In low resource settings, certain management challenges are seen, such as: inability to pay, treatment rejection, poor compliance, lack of education and awareness, long distance from healthcare facilities, insufficient medical professionals and equipment. Elevated IOP, increasing age, positive family history, racial background, myopia, thin cornea, hypertension, and diabetes mellitus. Racial background, increasing age, female gender, positive family history and hyperopia. History taking, including complaints; medical, surgical, family, social, professional, allergic histories; and review of systems. Evaluate the patient to assess for glaucoma and its stage. The equipment required for assessment are given separately for low resource and intermediate/high resource settings. The “Glaucoma Assessment Checklist” includes evaluation of: (1) Visual acuity [VA] (2) Refractive error (3) Pupils (4) Lids/sclera/conjunctiva (5) Cornea (6) Corneal thickness (7) IOP (8) Anterior segment (9) Angle structures [gonioscopy] (10) Iris (11) Lens (12) Optic nerve [ON]. Early ON damage may include a cup ≥0.5; focal RNFL defects; focal rim thinning; vertical cupping; cup/disc asymmetry; focal excavation; disc hemorrhage; and departure from ISNT rule. Moderate to advanced ON damage may include a large cup ≥0.7; diffuse RNFL defects; diffuse rim thinning; ON excavation; acquired pit of the ON and disc hemorrhage. (13) Fundus: Look for diabetic retinopathy, macular degeneration and other retinal disorders (14) Visual fields. Preservation of visual function is the ultimate goal of all glaucoma management strategies. The VF is a measure of visual function that is not captured with the VA test. VF testing identifies, locates and quantifies the extent of field loss. The presence of VF damage may indicate moderate to advanced disease. Monitoring of VFs is important to monitor disease instability. The recommendation for initiating treatment for patients identified with POAG is given, based on severity. A list of medications required for diagnosis and management of glaucoma is also provided. The settings for laser trabeculoplasty and cyclophotocoagulation are given. 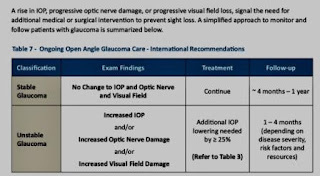 Follow up of patients in the form of “Ongoing open angle glaucoma care” is provided in brief. Indicators of unstable OAG are: (1) Elevated IOP due to poor compliance, drug intolerance or uncontrolled glaucoma. (2) Progressive ON changes such as expanding RNFL defects, new disc hemorrhages and rim thinning. (3) Progressive VF changes characterized by expansion of size and depth of defects, confirmed by repeated testing. Glaucoma can, therefore, be classified into: (1) Stable (2) Unstable glaucoma. The examination findings, treatment plan and follow-up schedules are provided. Iridotomy is first-line treatment for closed angle glaucoma patients. Initiating care recommendations based on pupillary block and plateau iris are provided. Laser iridotomy and iridoplasty parameters are given also. Indicators of unstable angle closure glaucoma: (1) Persistent angle closure= synechiae, failed iridotomy (2) Elevated IOP (3) Progressive ON changes (4) Progressive VF changes. Follow-up and treatment based on “stable” or “unstable” glaucoma is recommended. Factors such as prevalence of glaucoma in the population, screening for glaucoma and number of patients being treated, can be used as indicators to assess glaucoma eye care programs. Thank you so much author for highlighting such important and dangerous eye disease. Glaucoma treatment is very expensive. I adopted vision plans to afford my grand father's glaucoma treatment. I am really grateful to DentalSave.